What is the difference between endogenous and exogenous variables, considering the determinates of demand. This post was updated in September 2018 with new information and examples. 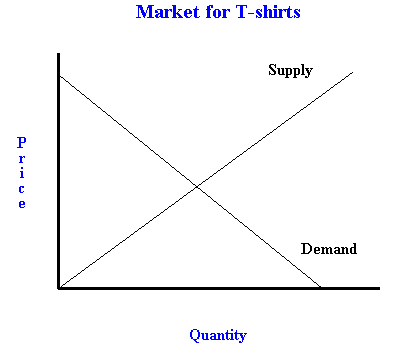 One of the things to do when analyzing a supply and demand graph is shift the demand curve. When we consider what factors will shift a demand curve, we need to make a distinction between the endogenous factors (those contained in the model) and exogenous factors (those occurring outside of the model). The easiest way to tell the difference between endogenous and exogenous factors is to look at the graph. 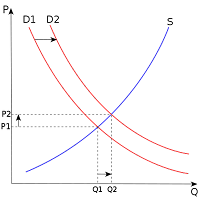 You can see from the graph to the right that both quantity and price are on the axis, which means they are controlled for within the model, or they are endogenous. Every other factor that is not controlled for would therefore be exogenous, (which means that it is determined outside of the model and held constant). Some determinants of demand include income, tastes and preferences, and number of buyers. If one of these exogenous factors change, such as income or preferences, then we would need to shift the demand curve because that factor is not accounted for on the axes of the graph. In this example, demand shifted right, so we would need to see an increase in income (assuming a normal good/not an inferior good), or a change in preferences towards more positive feelings toward the good or service being studied. Let’s look at another example using math. We will now go over several examples of calculating marginal benefit and marginal cost to show how to get this right on exam or homework questions. This example problem goes over the degree of comfort experienced at different levels of clean air. The different dollar value amounts are shown for every 10% increase in clean air. We want to find the optimum amount of clean air that we should have in this area, and it is important to remember that there is an optimal amount of pollution. Having 100% clean air is probably never going to be the solution. So the first step is to recognize the type of data we are working with. 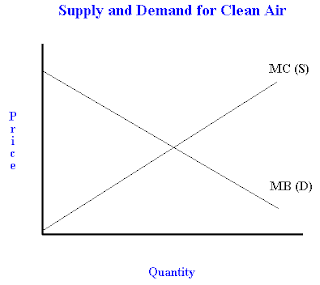 In this problem we have a table of information showing us what the benefits and costs are for different levels of clean air. This post was updated in August of 2018 to include new information and more examples. 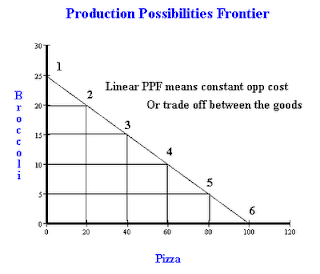 The idea of a production possibility frontier (PPF)--also sometimes called a production possibilities curve--can seem difficult. However, if you understand the intuition behind the economics of the PPF it is really just a graphical representation of what a country or individual is able to produce with a fixed amount of inputs. For example, most people are able to spend their day working or sleeping. A PPF would show this relationship between work and sleep (with the constraint of time in a day). There are five fundamental principles of economics that every introductory economics begins with at the start of the semester: rationality, costs, benefits, incentives, and marginal analysis. Below is a list of these five concepts with a brief intuitive discussion and examples. If you drove to work/school today, I bet you would disagree with this one (because of all of the irrational drivers out there). 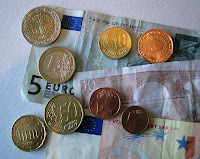 However, it is an assumption that economists make to let the models work. Remember that to economists, rationality means that people act in their own best interest with the information that they have available to them. It doesn't mean they make the best long term decisions, it just means they make the best decisions according to their own desire for happiness (with the information that they have). In general, most people are rational. For example people eat food, go to work, play nice with others, etc. If people behaved irrationally, then there would be no chance in the world to predict their behavior. By assuming that people are rational, and make decisions based on what is best for them, we can break down the decision making process. This allows us to study the factors that influence decision making. This post was updated in August 2018 with more information and examples. 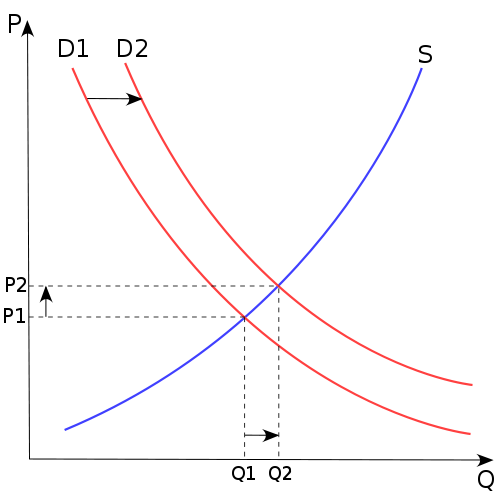 What happens to market equilibrium price if both the supply curve and the demand curve increase? This is a favorite question of teachers because the answer is "it depends". How can an answer to a text question depend? We have been taught all our lives that in school (not necessarily life) there is an answer to every question. However, in economics the answer often depends on the context of the question and when both supply and demand shift right, or increase, then the answer of what happens to equilibrium price is unknown without more information. 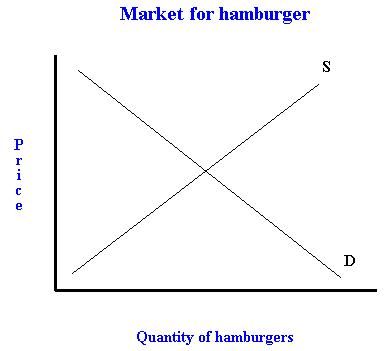 To begin this discussion let's look at the market for hamburgers. 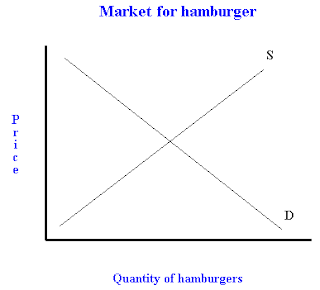 We will then shift both supply and demand to the right (increase them) for arbitrary reasons (maybe an increase in preference for hamburger, or it cures cancer or something, for the demand side and a decrease in input costs for the supply side). Use paypal to donate to freeeconhelp.com, thanks! If you have solved a question or gone over a concept and would like it to be freely available to anyone searching, please submit it to freeeconhelp.com at freeeconhelp (at) gmail (dot) com. Freeeconhelp.com, like wikipedia, falls into the "public goods" category and is therefore under funded. By submitting articles YOU are helping all those trying to learn the difficult science of economics and are contributing to this public good. If you do submit material, make sure that it is not already available anywhere else on the web, we do not condone plagiarizing at freeeconhelp.com. Please make sure that you own the rights or that it is available in the public domain. We don't want any answer keys or sample essays that are used in courses to be published at this site. Also, if you would like credit for your work, let me know and I can attach your name to the article, saying "submitted by:" or something similar. This could look great on your CV or resume, because YOUR work will always be available at freeeconhelp.com. This post was updated August 2018 with new information and examples. We all feel the pinch from an income tax on our lives, but how does it affect the overall labor market? The intuition behind shifts in demand and supply are a bit different in the labor market vs. shifts in the traditional goods and services market. 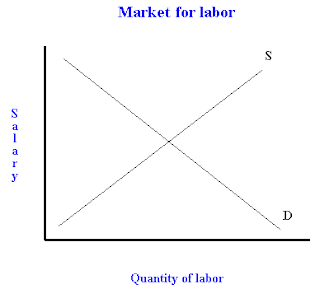 This post will go over the effect of an income tax on the labor market, and discuss some ways to help develop the intuition of why this is important in the labor market..
Take a look at the typical supply and demand model on the left for your typical labor market. Here S represents the supply of labor, people like you and me who apply for, and work at jobs to receive a salary. The higher the salary offered, the more people are willing to work, either by getting a job at all, or their willingness to work more hours. This is why the labor supply curve (the S curve) is upward sloping. 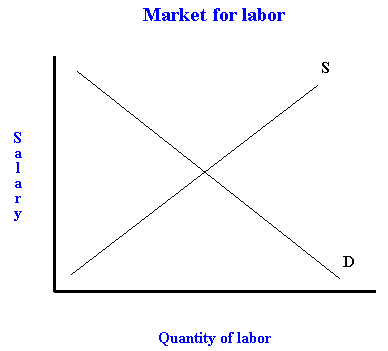 The curve D represents demand for labor. This would be corporations and businesses that need labor as an input in their production process. These businesses are willing to hire more labor (perhaps new people are pay them for additional hours works) if they can get it for a cheaper price, which is why the D curve slopes down. But what happens in this labor market when an income tax is introduced?